A little over 5 years I started working for a small company which had created a proprietary deployment system for updates to its website. The company had and maintained 3 servers (Development, Staging, and Live), and all the developers coded directly on these machines. Yes, that's right... I am Psudo-DevOps of the company! Now I have git installed on all our developers computers, and have them interfacing with GitLab, and have GitLad CI handling my deployments to various servers. Not quiet the setup I want, but its a step in the right direction. My immediate challenge is now getting a team very much not used to working with standards to start working with standards. The best way I can think to do this is with Task Automation. This is where Grunt comes in. if you have no idea what Grunt and / or Gulp are, they are task automation platforms written in Node, and you really should check them out. Even if all you do is play with a small website. Consider the previous configuration: Dev, Staging, and Live. I remove the Dev server from the workflow, its now redundant as I have vagrant running a local environment for each developer on there own workstations. This leaves me with the Staging and Live servers. At this point, the Staging Server becomes my Beta Testing or Quality Assurance (QA) Server, and Live is what it always has been; the Production Server. Now that I have developers working with git, It need to control the work being done somehow, or I am going to have a lot of branches trying to merge into the production branch all the time. This is when I introduce Semantic Versioning. This allows me to control the work being done, and when work gets deployed to QA and Production. This now brings me back to standards and task automation. I want my developers to work from and merge to a "Release Branch". What is that? Lets say I want to start a new project. I create a simple site, and with semantic versioning, I tag it at v0.0.0. My next release contains a bunch of features, but I only want one deployment to my servers, so I create a Release Branch called v0.1.0 which is branched off v0.0.0. All my developers branch of my Release Branch, and Merge there working code back into that Release. When my Release is completed, I merge it into QA for testing and requirements assessment. Assuming those passed, I complete the merge to master, and deploy the code to Production. I then tag master at that merge commit as v0.1.0. 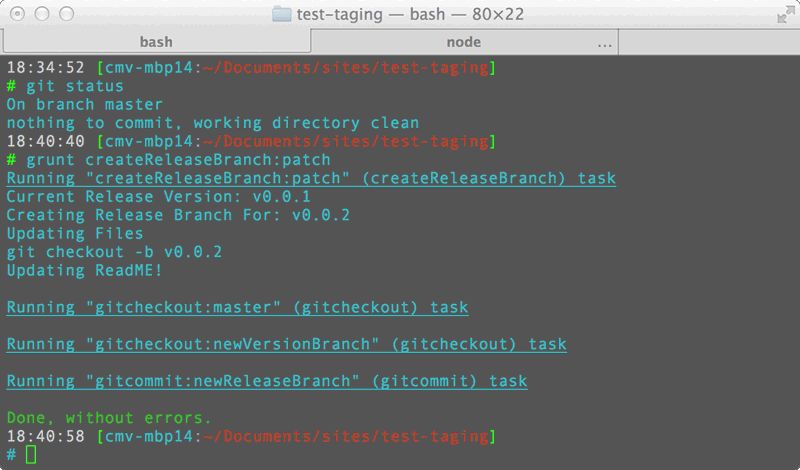 The part I am working on automating is that deployment and new release branch processes. To help maintain the standards I want to put in place, I need task automation to take care of a bunch of steps for me. In this case, I grunt to "checkout master", find the version number, create a new branch based on the next version number, goto that branch, edit the package and "read me" files, and commit those changes to the branch. I am not asking for a lot am I? so I have created the following grunt task as a preliminary prototype of that task. run with the command grunt createReleaseBranch:patch. Next will be the task to auto tag my Releases once deployed.